which you can find in a normal neighborhood movie theater. So our home theater seats is just for you. 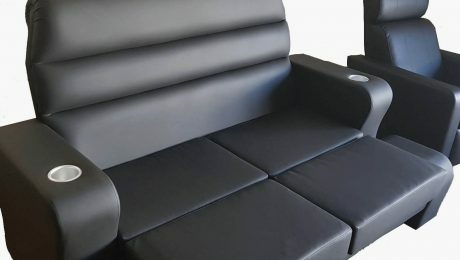 We produce seats for the home cinema that have a button on the side of the seat armrest. the seat angle from the usual sitting position to full lying position. with the possibility of heating or cooling the drinks. You can also add other kinds of custom-made features such as folding dining table that will give you a perfect home theater experience. Where else are these seats used? Dentists or private clinics also order these seats from us and use them in their clinic for the convenience of patients. And then there are cinemas that have VIP rooms which were they are using these types of home cinema chair & home theater seat. And as mentioned you can make new additions to these seats provided that the number of seats in your order is large enough. The conclusion is that if and when you need a home theater chair so we are the right address and your responsible choice! Do not forget it. High quality Cinema seating are the key to the success of your business.